Also called a pulpectomy, a root canal is a procedure used to address advanced tooth decay that has made its way into the very sensitive inner area of the tooth where the nerves and canals are housed. The treatment provides a way to remove the decayed tissue and restore the tooth so you can return to living a normal life. 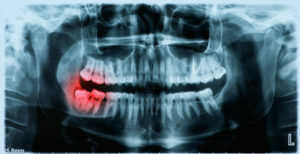 X-Rays – The process starts with your dentist taking X-Ray images to determine where the decay is located. Anesthesia – Next, local anesthesia is applied to the treatment area so you can enjoy a painless process. Pulpectomy – Then the dentist will make an incision into the tooth to remove the decayed tissue. He or she will then clean the area thoroughly. Filling – The space is filled with a special compound called gutta percha. The tooth is then sealed with dental cement. Bite Impressions – The dentist will then take bite impressions of your tooth that will be sent to an in-network lab that will fabricate a permanent crown replacement. Until it’s ready, though, you’ll be fitted with a temporary crown to protect your tooth. One of the perks of root canal therapy is that it can restore your tooth for life as long as the treatment site is maintained properly. It requires the basic care that any other tooth needs, which includes brushing and flossing at least two times a day to remove harmful bacteria that could contribute to new oral health issues. Practicing excellent oral hygiene also helps to keep the surrounding gum tissue healthy, which contributes to a lasting restoration. The ultimate benefit of root canal therapy is that it prevents a tooth extraction. This is significant because all your teeth rely on shared tension to stay in place. Therefore, when one is removed, the surrounding teeth may begin to shift, which can cause problems with occlusion (bite) and can lead to gum infection. So when you are proactive and reach out to your dentist at the first sign of any pain, you have a better chance of saving your tooth from advanced decay and being fully restored. To receive the expert care you need, contact your La Porte dentist today. Dr. Daniel Berquist earned his dental degree from Indiana University’s Dental School. He has since gone on to provide over five years of expert care from his private practice. Dr. Berquist helps patients recover from toothaches by restoring their teeth with root canal therapy at Region Dental, and he can be reached for more information through his website.